The Star Wars, Issue 1 Review! 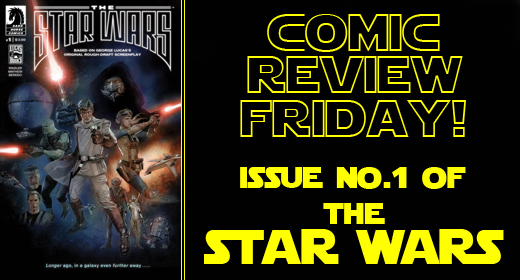 Comic Review Friday: The Star Wars – Issue 1! That’s General Skywalker to you…it’s Comic Review Friday! If you have been in contact with civilization at all since 1977 then you are probably aware of a little thing called Star Wars. Star Wars has shaped the way we view Science Fiction and Space Operas since its release. Not only did it redefine a genre, but it completely changed cinema. What you may not know is that in 1974 George Lucas passed a script off to Universal Studios that they deemed too difficult to understand. This epic story, which until recently, had not been told to the public was simply known as The Star Wars. Luckily, for you and I, Dark Horse decided to make this little piece of history into a limited run comic book. First thing you need to do when reading The Star Wars #1 is throw out everything you know about the Star Wars universe. While the elements are familiar here, this is not the universe that we have come to know and love. With characters such as General Luke Skywalker, Kane Starkiller and Annikin Starkiller, elements of the final story do seep through, but are arranged in a way to make the story completely foreign to the movie. While certain characters are familiar in name, these are not the same characters we grew up loving. Thankfully, the characters seem to be just as three dimensional as their final product counterparts. While, I cannot give full credit for this to Rizler, who scripted the book, he must still be praised for taking the original rough draft and making the characters work in comic form. Sadly, at this point we have not got to see the lizard-like Han Solo, and we have seen but a few panels of Princess Leia and the fully human Darth Vader. The story, like everything else in this book, maintains a lot of connections to the movies, but the pieces are arranged differently. I do not want to spoil much here, because Lucas is a master story teller, even in his rough drafts. What I can tell you is that there is a lightsaber duel early, and you might be surprised at the colors of the lightsabers. This issue did serve primarily as an introduction. This is not necessarily a bad thing, since the content is dealing with a known property in a vastly different way. It is nice that Rizler is easing us into this new universe instead of throwing us head first. While there is not much negative to say here, there are a few problems with the book. I do not think the scriptwriter and the artist where quite on the same page. I have been reading comics for many years, and even with books that have terrible art, I can interpret the connection been the dialogue and the art fairly easily, but in The Star Wars there were times where I was taking a minute or two to try and digest a single panel. Rizler and Mayhew need to make sure that the dialogue and the art match up from this point on, because this can be a book killer. Overall, The Star Wars is not really much more than a fun ride down nostalgia lane. Even with all the differences the book plays heavily off of our fond memories of the original trilogy. Nothing is wrong with this, but I would really like the book to stand on its on. The question is: With Star Wars being as big as it is, is that even possible? I give it a solid three out of five stars. Tony Jacobs liked this on Facebook. Tiffany Girdner liked this on Facebook.